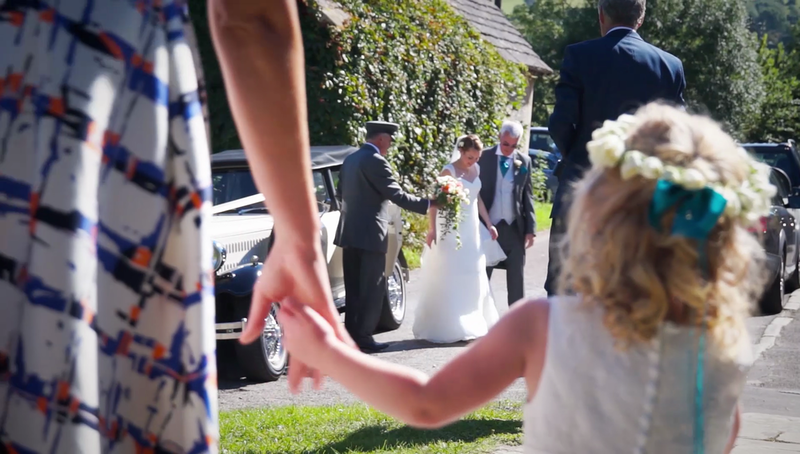 I'm a Dorset based videographer and I run Harry’s Wedding Films as part of our family video production business, Plato Video. I love creating entertaining, vibrant, personal wedding videos. It's a creative process I've been perfecting since 2004. My aim is to give couples a beautiful record of their day, something they’ll be excited to relive and proud to share with friends, family and future generations. Continue scrolling to watch my featured Highlights films and learn more about my style and what I can create for you. We wanted to say a huge thank you Harry for making the wedding video for us. Can’t wait to get round all the friends and family and let them see it. It’s truly special! Exactly what we wanted to remember the day by. Honestly, I can’t explain how massively impressed we are with how well its turned out. Love every part of it and worth every penny. The best bit is we only recall seeing you as the Morris pulled into the reception, yet you were there all day with us. We will cherish it for ever and one day laugh (cry) whilst watching it with our own children just like we did with our parents. I always keep in mind that not only is this a day of great significance for you as a couple but it’s likely to be a unique gathering of friends and family. I can't promise you won't notice me but I always try to be as unobtrusive and discrete as possible without sacrificing the quality of my work. With all my films, regardless of the package, I try to capture the energy of the occasion - while considering your personalities, your guests, the atmosphere and the emotion of the day. I know how special a professional recording of your day can become, so it’s important to me that you love what you receive. My work isn't done until you tell me you're happy with it. Harry, thank you so much for capturing our wedding day so beautifully last year. You really have such a talent. The DVD of our wedding was absolutely amazing! My Highlights films tell the story of your day in about 5-8 minutes. It’ll include the most memorable, funny and romantic parts of your day. It’s something I hope you’ll never get tired of watching! The Highlights video is made for sharing. I put a lot of thought into how it flows and how it looks, keeping your personalities and the atmosphere of the day in mind. This ensures you receive something completely personalised to you as a couple. As each video will contain so many different elements from a wedding day I can't say exactly what your video will look like so I recommend checking out some of the examples on this page. The music is carefully chosen to match you and your day. If you'd like to be involved in this process, I'd be happy to consider that. The music I choose comes from a specialist music licensing website so your video can be shared online without copyright issues. My Full Feature film gives you a detailed record of your day, usually around an hour long. It has the ceremony, speeches and first dance in full as well as montages in between. It's there for when you want to relive the day as it was. Here's a running order of what can normally be expected in one of my Full Feature videos. It starts with a short montage set to music. This may include guests arriving at your ceremony venue or bridal/groom preparation depending on what you'd like me to capture. After the montage the ceremony begins and you'll be able to relive the full event. Where possible I'll include multiple camera angles and you'll hear sound of the vows, as well as any readings. This will be followed by another montage set to music. The content of this will vary depending on what you've got planned for the occasion. Speeches will normally follow the montage and these too will be in full. Again, multiple camera angles will be used where possible and you'll hear all the speakers. Depending on what you've got planned, there may be another montage or we'll go straight into some dancing. The first dance is filmed in full and where possible, from multiple camera angles. Music will either be added in editing to match what you danced to or if you've got a band I'll make a recording on the night. Either way you'll likely hear sound from the night, just to capture the ooohs and aaaahs that often accompany this romantic part of the day. What follows will depend on what you've got planned but it will most likely include friends and family packing out the dance floor, having the time of there lives! I'll sometimes finish the video with the First Dance as this can feel like a more natural end. Music over the montage sections is chosen by you and can be anything you like. I prefer to keep these videos private as they tend to contain personal content that a couple might not want made public. Therefore, I don't have any Full Feature example videos on my site. If you need more info please get in touch and I can explain what yours will look like based on the day you've got planned. The packages above are just a snapshot of what I offer, please get in touch to see my full list of options. All my packages are based on the options I've set out below. Tap the options to see more info. I like to make my packages customisable so feel free to ask for your own requirements. I still use two cameras on the day but additional cameras will be unattended and completely static. You decide how long you need me on your wedding day. One of my popular packages is 'Ceremony Only.' With this option I'm at your wedding from arrival of guests until shortly after the end of the ceremony. Receive a USB stick with just the Highlights of your day. This option is great if you don't need my Full Feature or you want to make your own with my unedited video files from the day. With this option your Highlights video will be between 5-8 minutes in length. Receive a USB stick with just the Full Feature of your day. This option is great if you don't want my Highlights video. If you'd like to put your own personal touches to your wedding video and edit it yourself using either professional software or more mainstream programs such as iMovie and Windows Movie Maker, all you'll need is an external hard drive so I can give you the entire library of raw footage from the day. Some couples like this option simply because they receive everything that was professionally captured from their special day. A collection of video clips that can be dipped into at any time. Please contact me for specific details on what you'll receive. It's helpful to know whether you plan to edit the video files or just keep them as a collection. Did you know I can also capture your wedding day on Super 8 cine film? Go to my vintage wedding page here to get some more info, packages and example films. This option isn't in the HD video package and prices list I send in replies to enquiries so be sure to let me know if this is the style you're after. Just so you know, I can create a HD video and Super 8 film combination package. If I've edited your films you'll receive a USB stick to store the files. However, if you'd like DVD's or Blu-ray's as well I can create as many as you need. Production of discs will be at additional cost. You might find that after seeing my packages and prices list you don't see an option to suit the record you want of your day. This isn't a problem because I'm more than happy to listen to your plans and create a bespoke package based on your needs. Are you having a vintage themed wedding or do you love the look of Super 8 cine film? Check out my Vintage Wedding Films page for more info. I prefer the personal touch in wedding videography. I want couples to know who's producing their wedding video. My brand, Harry's Wedding Films comes with the promise that I will be there on your wedding day to capture it in full and create your video from start to finish. Learn more about me and what sets me apart here. Please check out some real reviews on my Facebook Page here! I'm happy to travel anywhere in the world! But just so you know, I usually add a travel charge and any other costs involved in getting to your venue if you're over 50 miles away. It's a very reasonable charge and only covers my fuel and time. I'm within a 2 hour drive from many wedding venues based in and around Poole, Southampton, Portsmouth, Hampshire, Devon and Wiltshire. I have three cameras in my kit, suitable for a range of different scanerios, all with large sensors so I can produce life like, cinematic quaility video. For those who need to know details, here's what I use: Sony A7sII, Sony a6000 and Sony VG-30. For sound I have two small Tascam recorders. They are perfect for discreet placement almost anywhere. I also use a Zoom recorder so I can connect to sound systems, allowing me to capture speeches where microphones are used. During the ceremony I use a lapel mic on the groom which does a beautiful job of capturing both the bride and groom saying their vows. + Do you give discounts? Sometimes. It depends on a number things. Like the time of year of your wedding, whether it's a weekend or weekday and how many bookings I already have around that time. My busy period is from May to October. + What's your booking process like? First, you let me know where and when your wedding will take place. I'll tell you if I'm free and we'll talk about your options. I'll hold your date whilst you make your decision or until I receive another enquiry for that date at which point I'll be in touch to let you know another couple is interested and give you first refusal. If you decide to book, I'll give you a booking form which we'll both sign if you're happy with the terms. A £350 deposit is required to secure your booking. A 2nd payment is payable no later than ten days before your wedding date. If you choose an edited packaged a 3rd and final payment is due once all the videos in your package are ready to be delivered. + How long do you take to edit the videos? And where's the big day? Talented, local wedding suppliers I've had the pleasure of working alongside.